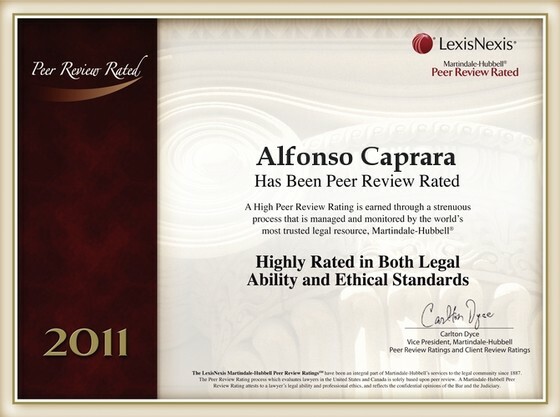 Alfonso Caprara is an excellent attorney with over twenty-three years of professional experience in handling United States Immigration and Nationality matters. A native of Philadelphia, he is fluent in Spanish, French and Portuguese. He studied at Saint Joseph's University in Philadelphia, Pennsylvania where he earned his Bachelor's Degree and at Villanova University School of Law in Villanova, Pennsylvania were he earned his Juris Doctor Degree. He is a member of the Pennsylvania Bar Association, the Philadelphia Bar Association and the American Immigration Lawyers Association. He has been privileged to serve the Immigration Bar in Philadelphia as Chair of the American Immigration Lawyers Association and on the AILA Board of Governors. He is a co-editor of Ethics in Your Immigration Practice...have you considered ? published in 1998 by the American Immigration Lawyers Association. He has practiced before Federal Courts, the Board of Immigration Appeals, Immigration Courts, and all immigration related federal agencies. He also has extensive experience in representing athletes, performing and creative artists and religious workers.